ECE ILLINOIS Assistant Professor Can Bayram has been awarded the Young Scientist Prize in Optics by the International Union of Pure and Applied Physics for revolutionizing the way graphene has been employed and making major contributions to III-V photonic devices. 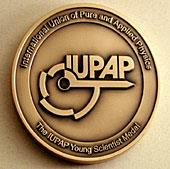 An Affiliated Commission of IUPAP, the International Commission of Optics (ICO) adopted the IUPAP Young Scientist Prize in Optics in 2008 and awards the prize annually to a scientist who has made noteworthy contributions to applied optics and photonics during a maximum of 8 years of research experience after having earned a PhD degree. As the recipient of this internationally recognized award, Bayram will receive the IUPAP Young Scientist Medal with his name and discipline (optics) engraved on the back, a citation, and a 1000 euro money award. Bayram is the first awardee from the University of Illinois and is only the second awardee from the U.S. ever to be recognized in this annual worldwide competition. Read more about the award at the ICO site.